Are You Able to Keep Up With the Flow of Money Into & Out of Sectors? You need Technology & Filtering to give you the EDGE to win! Our Method to Beat the Markets: Only own the STRONGEST Investments. 3. 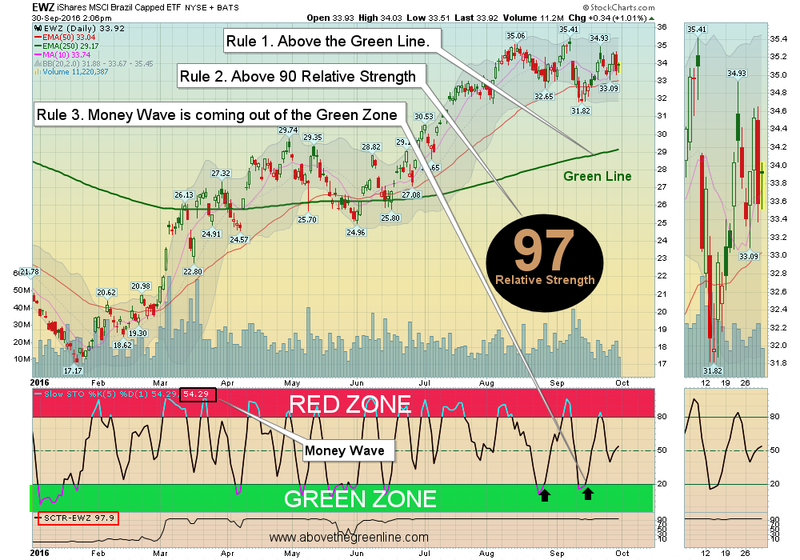 The Money Wave should be < 20 and turning up (Buy in Green Zone, Sell in Red Zone). KEEP IT SIMPLE: We will email or text you when to Buy Investments from our Stock, ETF and Commodity pages. Buy when they are coming out of the Green Zone, and take profits in the Red Zone. Split your account into 3-8 positions with Sell Stop Losses. Your email or Twitter account @AboveGreenLine will have Entry Points and Sell Stop losses, or follow on our Positions Page.